Prior to becoming a judge, Deputy Chief Judge Fox was a lecturer in law at Victoria University, and then a Senior Lecturer in law and Director of Graduate Studies at the University of Waikato. 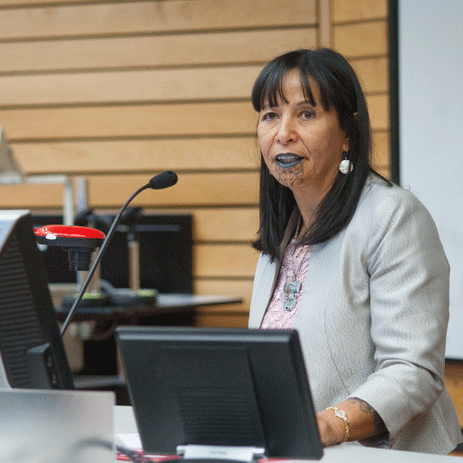 In addition, she acted as legal counsel for Treaty claimants and Māori land clients. A specialist in international human rights, she was a Harkness Fellow to the USA from 1991 to 1992 and a Pacific Fellow in Human Rights Education employed by the Commonwealth Fund for Technical Co-operation 1997-1999. For her work in human rights she won the NZ Human Rights Commission 2000 Millennium Medal. She was appointed to the Māori Land Court on 1 October 2000 as the first Māori women since the Court was constituted in 1865, and was later appointed as Deputy Chief Judge on 20 February 2010. She is the resident Judge for the Tairāwhiti District of the Māori Land Court, hearing cases in Ruatōria and Gisborne. She presides in the Māori Appellate Court when the Chief Judge is not present and since 2017, she has been delegated responsibility to deal with special applications for the Taitokerau district pursuant to s 45 of the Te Ture Whenua Māori Act 1993.